How stakeholders should work together to end open defecation. Solving rural sanitation problems in India requires the involvement of multiple stakeholders. These include government, programme implementers, financing institutions, entrepreneurs and households. Understanding the roles, strengths and weaknesses of each stakeholder, how they interact and complement each other, is key to achieving India’s ambitious goal of ending open defecation by 2019. As a follow-up to the Sanitation Innovation Accelerator, IRC, Ennovent and Ecociate Consultants commissioned a study to gain insights in the sanitation market in Bihar and Odisha, two states with relatively low levels of sanitation coverage: 29% and 43% respectively. The study was conducted over a period of 3 months (from January to March 2017) in two rural districts: one with a high population density and situated in a heavy clay silt agricultural plain (Samastipur district, Bihar) and the other with a low population density situated in a sandy tropical coast (Ganjam district, Odisha). The World Bank in Ethiopia has commissioned a rapid survey of what motivates people to upgrade their latrines, with the aim of delivering behaviour change communication materials with greater impact. The survey is being conducted in four regions, with the main target audiences being adult women, male heads of households, opinion leaders and existing sanitation businesses. The aim is to pilot and produce materials that emphasise the dignity, prestige and status of having improved sanitation, rather than focusing only on health messages. The WB decided a new approach was needed after Demographic and Health Survey (DHS) figures for 2016 suggested that only 4% of rural households in Ethiopia have improved toilets facilities while a further 2% have facilities that would be considered improved if they were not shared. This is well below the Joint Monitoring Program figure of 28% for improved latrines (although we understand this may be revised down to around 14%). Indeed, according to DHS, although access to some form of sanitation has risen, access to an improved latrine has declined in percentage terms over the past ten years. Most latrines in rural areas (55%) do not have an effective slab or lid while more than a third of rural households (39%) practise open defecation. The Government of Ethiopia has a flagship programme to increase use of improved latrines to 82% by 2020. At a launch meeting in Addis on 23 March 2017, social market consultant, Addis Meleskachew, said that this initiative will develop a memorable brand for marketing materials that will encourage the private sector to provide materials and will attract rural families to buy them. Dagnew Tadesse,Hygiene and Environmental Health Case Team Leader for Ministry of Health, welcomed the initiative to attract business but emphasised that the GoE approach is based on a comprehensive health education strategy with multiple messages including hygiene awareness, handwashing and safe food, and said that these important messages should not be abandoned. Jane Bevan, rural WASH Manager at UNICEF Ethiopia offered to share extensive data that UNICEF has collected for its country programme on attitudes to sanitation, which has identified the high cost of concrete slabs as a significant obstacle. She presented examples of low cost options for upgrading sanitation in a pilot project in Tigray region. It was agreed to collate all existing KAP studies and relevant data including research by SNV. Monte Achenbach from PSI and John Butterworth from IRC spoke about the work being started by USAID Transform WASH to market innovative sanitation models. John Butterworth said there is a need to make people aware of what is available and to get materials to where they are needed. The World Bank research is being conducted by 251 Communications. This blog was originally posted on 5 April 2017 on the IRC website. Almost 600 million Indians living in rural areas defecate in the open. To meet the ambitious targets of the Indian government’s Swachh Bharat Mission Grameen (SBM (G)) – the rural clean India mission – plans to eliminate open defecation by 2019. SBM (G) is time-bound with a stronger results orientation, targeting the monitoring of both outputs (access to sanitation) and outcomes (usage). There is also a stronger focus on behavior change interventions and states have been accorded greater flexibility to adopt their own delivery mechanisms. The World Bank has provided India with a US$1.5 billion loan and embarked on a technical assistance program to support the strengthening of SBM-G program delivery institutions at the national level, and in select states in planning, implementing and monitoring of the program. 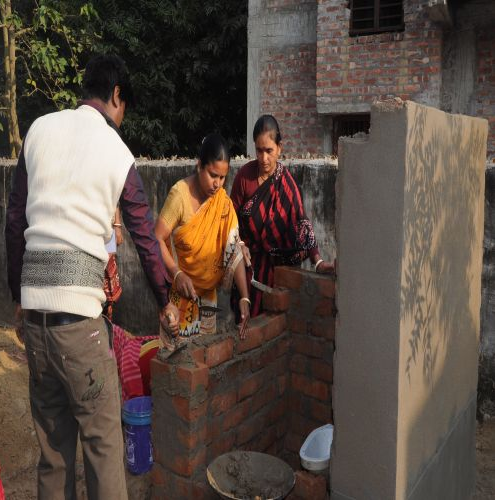 The UN has awarded one of their prestigious 2015 Public Service Awards to Nadia district in West Bengal for their sanitation initiative Sabar Shouchagar (Toilets for All). Bordering on Bangladesh, the rural district has a population of 5.4 million of whom nearly 2 million or 40% practised open defecation in 2013. This was in sharp contrast with neighbouring Bangladesh, where only 4% of the people practise open defecation. This realisation sparked the district to start pooling available government resources and develop the Sabar Shouchar concept. Besides pooling government funds, the concept involved mass awareness campaigns, parternships with NGOs, focus on women and children as change agents, rural sanitation marts, transforming district administration and a 10% mandatory user contribution to cost of toilet construction. All this resulted in Nadia becoming the first Indian district to be declared open defecation free on 30 April 2015. Nadia district will receive its award from the United Nations Secretary-General on 23 June 2015 in Medellin, Colombia. Today sees the launch of Public Finance for WASH, a research and advocacy initiative aiming to increase awareness of domestic public finance and its critical importance for water and sanitation provision in low-income countries. Check out our website www.publicfinanceforwash.com. This is a collaborative initiative between IRC, Water & Sanitation for the Urban Poor (WSUP), and Trémolet Consulting. A key aim is to offer easy-to-read but rigorous information about domestic public finance solutions: our first three Finance Briefs are now available for download from our website, and over the coming year we will be building a comprehensive resource library. And just to make sure we’re on the same page: what exactly is domestic public finance? Essentially, it’s money derived from domestic taxes, raised nationally (e.g. by the Kenyan government) or locally (e.g. by Nairobi’s municipal government). This money is going to be critical for achieving the water and sanitation SDGs: so how can we all work together to ensure that what we’re doing is supporting (not inhibiting) the development of effective public finance systems? And how can public finance be spent in ways that catalyse the development of dynamic markets for water and sanitation services? To find out more, please check out the website. If you’d like to become involved in any way, get in touch! How does India’s new large-scale sanitation monitoring effort compare with similar initiatives in Bangladesh and Indonesia? According to some media the Indian government has unleashed “toilet police” or “toilet gestapo” into the country . In fact, the central government has instructed local officials to take photographs of new toilets to prove that they have not only been constructed but are also being used. If states don’t upload photos by February 2015, the water and sanitation ministry has threatened to withhold funding from a new national sanitation programme .